Perfect for hands-on hobbyists. Foot-pedal speed controls free up your paws to do the real work. 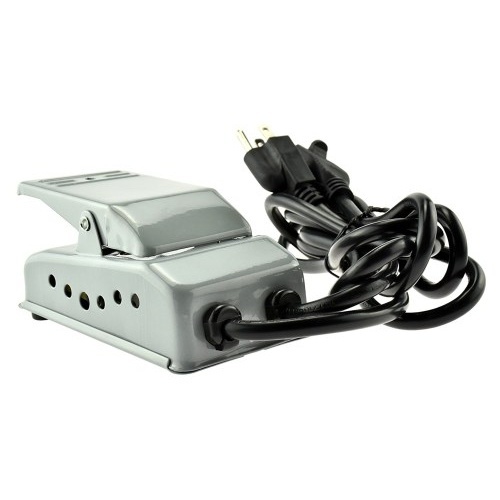 This one's for 120VAC devices, and ideal for machines using approx 200W or 1.6A or less. Measures 5" x 3" x 2-1/4" tall, with a 6-foot cord that plugs into the wall and a 2-foot grounded female plug for your sewing machine, rotary tool, scroll saw, or, if you really make a lot of banana Daiquiris, blender. 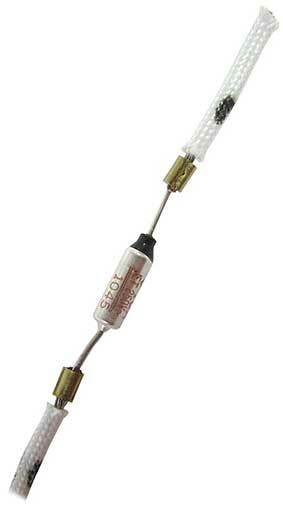 Rated for 10A at 250VAC, these normally closed thermal fuses will pop at 128ºC or 262ºF. The fuses themselves are 1/2" long but yours will be wired into leads of assorted lengths, because they were betooken out of coffeemakers of some sort. Never been popped, though, because then they would be useless and who'd buy 'em? Need To Sense Some Fluid Pressure? Our VP for Sensing Fluid Pressure called this sensor from Kavlico “sweet.” Needs a 5VDC 20mW power source, and will likely put out 0-4VDC, contingent on pressure, from 0-5"/H2O max, we’d say. Measures 1-5/16" x 17/32" on a pair of 7/8" long 5/32" slotted mounting wings. 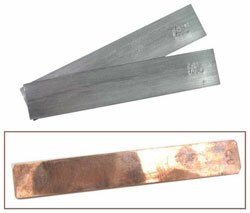 The upper 3/16" OD barb is the low side, and the lower is (ironically) high. 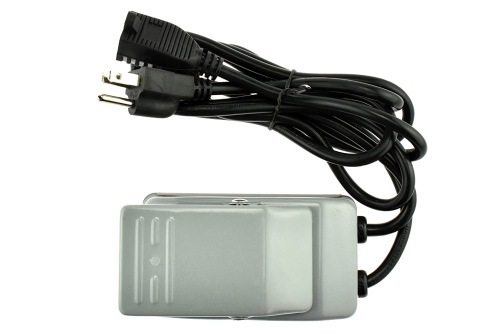 Has a 3-pin connector with legend on the back for power and output. Call for a data sheet. 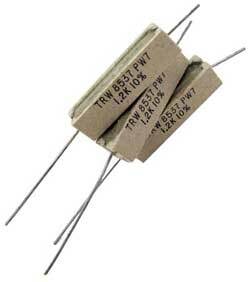 With this 1.2K OHM 10% tolerance power resistor. Rated 3 to 5 watts, it has a ceramic block body 3/8" sq x 1-1/2" long with wire leads on ends, one of which is 1/2" long and the other 1-1/2". Any questions? These black aluminum alloy heat sinks have flared fins at 1-3/8" x 1-1/2" x 1/2" with (2) pins out one short side and (3) 1/8" mounting holes in the center. 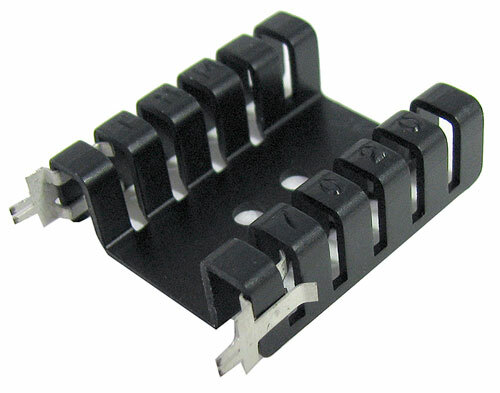 Wethinks these are PCB mounts for TO series chips. 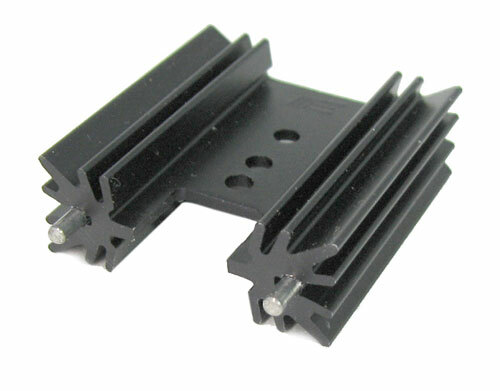 Our black anodized channel-style heat sink measures 1-1/4" x 1-1/2" x 7/16" with folded back fins and a pair of 1/8" mounting holes in the flat center. Come on, you've got some heat to sink. Who doesn't? 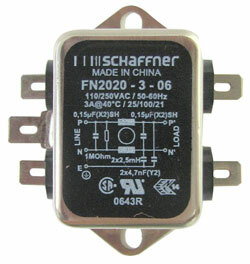 This chassis-mounted in-line EMI filter from Schaffner (model #FN2020-3-06) accepts up to 3A at 110/250VAC. 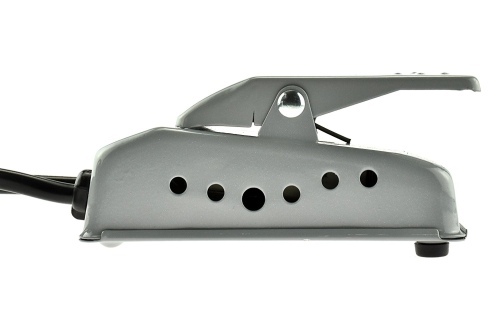 Unit measures 1-3/4" x 1-5/16" x 1-3/16" with (2) 3/16" mounting holes on side wings. 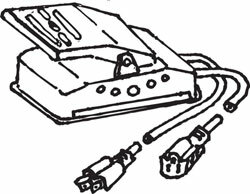 Has 1/4" quick-disconnect terminals and has a wiring diagram on the housing. UL/CSA. 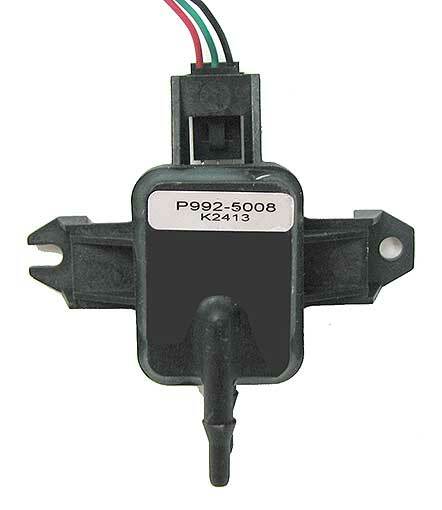 From Honeywell (part #AWM730B5), this medical airflow sensor is a takeout with a range from -300 to +300 SI/min. With a 5V activating current, will give an output between 0.5 and 4.5V responding in <10ms. Pins 1-4 are +15VDC in, ground, 5V in, and output. Unit measures 1-7/8" long x 13/16" dia, mounted on a 1-1/8" x 1-3/4" bracket. We'll include a spec sheet. Made in the USA. 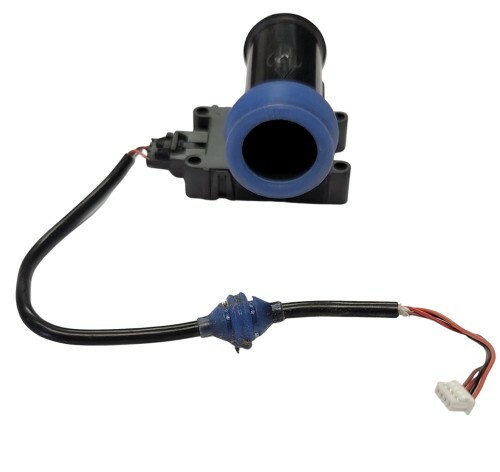 This 4" x 3-3/4" x 1-3/4" medical take-out air sensor has (3) ports coming off the main 3-1/8" x 3/4" ID chamber, (2) leading to one sensor and the other leading to a second one, then through circuitry on a mounted PC board leading to a 10-pin output connector. Also has a PCB-mounted 3V coin cell battery. The sensors have input, output and trigger voltage and a voltage output, but we have no specs. Nice parts and pieces, though. 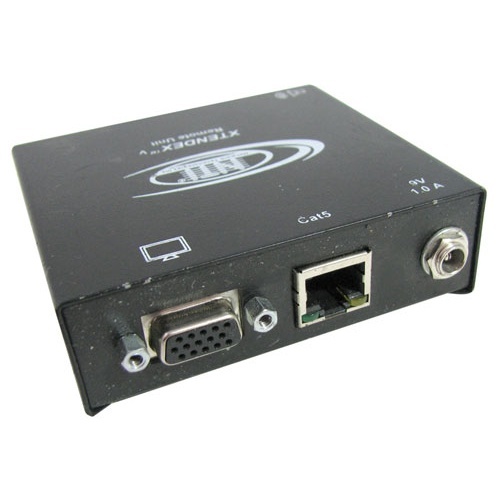 This remote VGA receiver measures 3-1/4" x 3-1/2" x 1-3/16" and is made to use with the NTI CAT5 VGA remote system which allows VGA and sound info to be transferred up to 600 feet on a CAT5 cable. Don't have the system? Pop the rivets on the bottom and you've got a dandy project case, a PCB-mount 5.5mm barrel plug and 1/8" audio jack plus whatever you can strip from the PCB board.